Minimum Wage Increase Coming – Is it Right? Bringing up the validity or fairness of the minimum wage is always a surefire way to stir up some controversy. With the new federal minimum wage set to increase to $7.25 an hour later this month in July 2009, 29 states are going to be affected in the midst of a severe recession. Economic woes aside, let’s delve into the bigger question of whether we should even have a minimum wage and what it actually accomplishes. Minimum Wage Rules are pretty straightforward. While some states already had minimum wages exceeding that of the Federal minimum wage, employers are mandated to pay whichever wage rate is higher – state or federal. 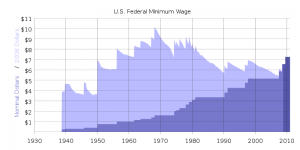 As this chart illustrates, in present dollar terms, the minimum wage has not been increasing, but rather decreasing during the past few decades. Is this a reflection of the obsolescence of the minimum wage or a growing disparity in income in the US? While correlation is not necessarily causation, I had highlighted in an earlier post that the US did not fair well in the category of distribution of wealth in comparison to other nations. At $7.25 per hour, a 40 hour workweek would bring in just over $15,000 per year. For a single wage earner trying to support a family, $15,000 can’t reasonably sustain an acceptable standard of living in the US, no matter what the cost of living is in area. This begs the question as to whether the federal minimum wage is even serving its intended purpose. Conversely, many workers earning minimum wage are not in such a predicament. Many are teenagers working in unskilled areas of the economy such as restaurants and malls. Let’s be realistic about the number of people impacted: 1.7 million workers with wages at or below the minimum made up 2.3 percent of all hourly-paid workers, or 0.56 percent of the population of the United States. Small business often complain that they will have to cull staffing to account for an increase in minimum wages. Otherwise, they would have to increase prices to account for their higher payroll expenses. On a net basis, I’ve never fully understood this argument. You either need a worker or you don’t. If your demand is the same (generally, the economy at large does not plunge into recession each time a wage increase is enacted), you either need the same workforce or you need to become more efficient with less workers (which you could have done prior to said wage increase) or you need to pass on costs to your customers. The net outcome is probably a combination of each every few years when an increase comes through, but with so many increases under our belt, you’d think small businesses would just be prepared for this in a routine basis and factor that into business planning. It’s like complaining when the cost of a stamp goes up – we all know it’s coming. Now, to argue against a minimum wage increase on principle…that’s a different story. If you set aside the societal implications of establishing a minimum wage, the economic reality is that you’re in effect establishing an artificial floor in wages, hence interfering with free market forces. In what is arguably the most market-based economy in the world, how do we allow this dichotomy to exist? If the going market rate for an unskilled labor classification of say, dishwashers, is $5 per hour, of what net benefit to society is it to pay more than 40% that fair market rate? The economic reality is that these types of jobs end up going to illegal aliens (or for the p.c. police – ‘undocumented workers’) where they are paid an “underground fair market rate”. A natural rate is established anyway. If the restaurant up the road is willing to pay $5.50 per hour, in the absence of a better opportunity, labor will flow to the highest paying employer. Recall in the 1970s the mile-long gas lines. Why did this occur? Because the government imposed an artificial floor on the price of gasoline. Politicians seeking to curry favor with constituents imposed restrictions on the price of gasoline. Rather than letting the free market drive up prices and restrict demand, such as what we saw in 2008 as painful as that was, an artificial floor on the price of gasoline interfered with the natural supply/demand equation, resulting in perhaps an ever more disturbing situation – continued high demand coupled with high prices while not addressing the underlying problem or allowing the market to correct itself via natural suppression of demand. Economically speaking, minimum wage laws artificially manipulate wages in contrast to free market forces. But Wait! The issue is more complex than the consideration wanton free market capitalistic theory in a vacuum. Let’s go back to that family provider trying to get by on $15,000 per year. The federal poverty level is around $11,ooo for individuals and $22,000 for a family of 4 (source). What price is the country paying to subsidize this family with the various welfare and social assistance programs this family is entitled to due to the annual income below the poverty level? Is it a wash? Is it a net negative? Advocates claim that turnover is lower with a higher minimum wage. I’m not sure what the correlation is there, but it does stand to reason that turnover would be lower in a conventional minimum wage environment compared to letting market forces set the rate. For instance, with an employer offering no benefits or any other reason to stay other than that $5 per hour, it would be quite easy to leave for the employer up the road offering $5.50 per hour. However, if each employer is offering the same minimum wage of $7.25 per hour, all other things being equal, why leave? There are myriad assumptions of course and you could probably make a strong case either way when you start considering factors like lower turnover and governmental assistance. There are vocal camps on either side of this equation. Where Do You Stand on the Minimum Wage Debate? Jobless Rate Drops to 9.4% – But What’s the REAL Deal? I took a look at this in my article “The Minimum Wage Mistake“. I believe that the minimum wage is freezing people who are willing to work out of the market by putting a price floor above the demand of some types of workers (perhaps the dishwashers, in your example). It’s my contention that if society wishes to set a minimum cost of living (which I believe that it does), the best way to do that is with a negative income tax (similar to the EITC). A tax of that type would eliminate the ‘working poor’ class, those drawing benefits while also working (this would free up some of the resources of our social welfare programs). Also, this would shift the burden of minimum wage law increases from small businesses to society at large. The minimum wage is a law that on the surface seems to promote equality, but it is hurting the very group it is supposed to help.